New Construction. 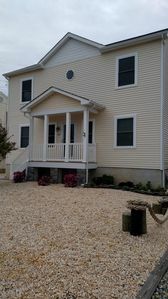 Gorgeous custom home with 4BR's and 3 ½ baths, located on Barnegat Bay. 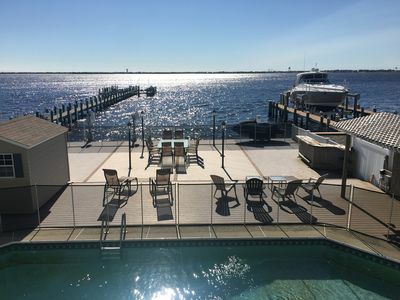 This home features high-end furnishings, decor & attention to every detail with water views from almost every room! Fireworks from across the bay can easily be seen on summer nights from the comfort of our deck and balcony! 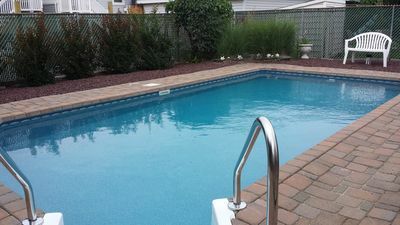 A heated 30 x 15' in-ground salt-water pool with diving board and baby safety fence. There is an outside shower for convenient easy cleanup. 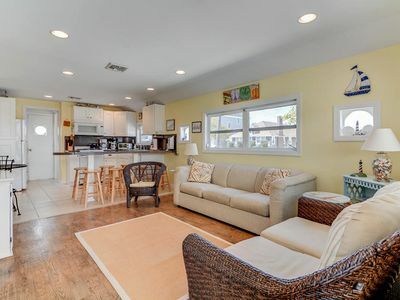 The ½ bath is under the house in the garage for convenience while swimming and playing! 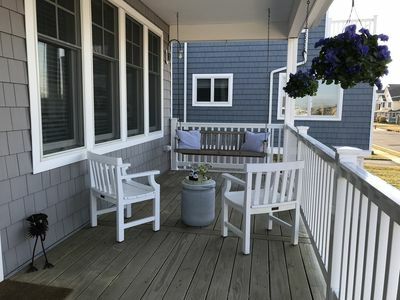 The second floor back deck is off the living room which has sliding glass doors and has a table for 4 and a rocking chair overlooking an amazing sunrise. 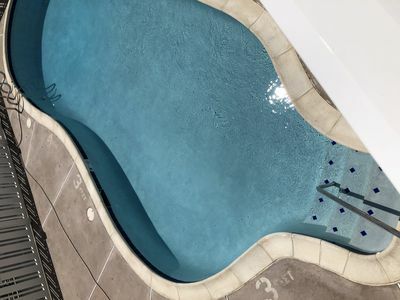 The stunning view from both the upper and lower decks provide the perfect place to unwind and relax with a drink at the end of a busy, fun filled day. There are three outdoor seating areas on the lower deck. The lower deck exceeds 1000 sq ft which our table of 10 sits comfortably. Another set that seats 6 and a 4 person padded conversation piece with table. 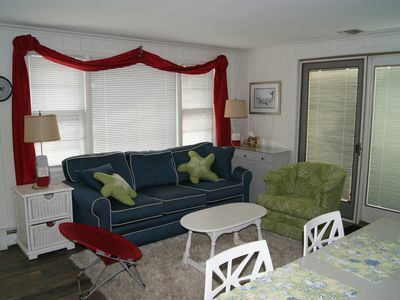 Watch a game or enjoy cable TV on a 32” flat screen mounted outdoor TV under the covered deck. 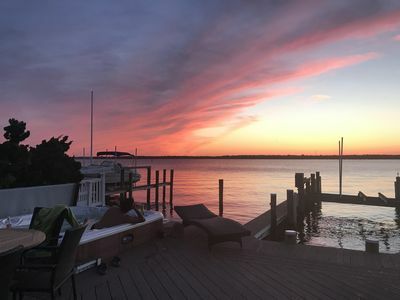 Fish, crab or swim anytime off the back deck into the Barnegat Bay. There is a second story porch in the front of the house with a rocking chair to watch a beautiful sunset. (Note: Pool opened Memorial Day Weekend through Labor Day Weekend). 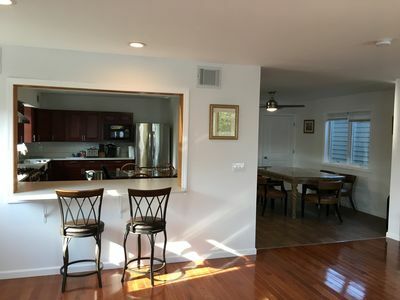 The first floor features a playroom with sofa sleeper, full bath, full kitchen, dining room and living room with sliding doors to covered upper deck. 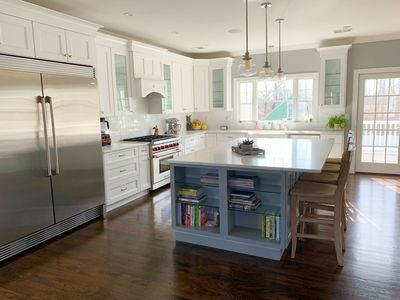 The kitchen has an island that seats 2, a peninsula that seats 3 and a large wooden dining table with two extensions that seats 10 comfortably. The living room has a gas fireplace, 60” mounted flat screen SMART TV with cable. Sliding glass doors lead to the upper back deck off of living/dining room. 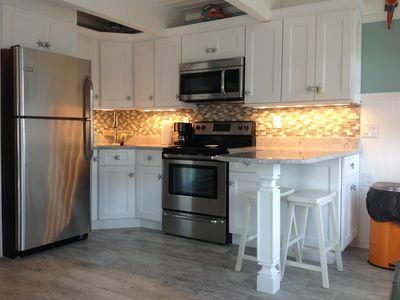 The Second floor features three bedrooms, two full baths and laundry room. The “yellow” bedroom sleeps 5: one queen bed, bunk bed with full bottom and twin top. The “blue room” sleeps 4: two full beds. The Master Bedroom has a king bed and private full master bath. Each bedroom has plenty of floor space for an air mattress and/or pack n play. The Master bedroom and “yellow” room each have flat screen mounted cable TVs, where the “blue room” has a flat screen mounted TV, no cable, but an HDMI adapter for portable gaming and/or DVD system that can be hooked up. * Sorry No Young Adult, Group or Prom Rentals for this home. This is a family neighborhood; very quiet. 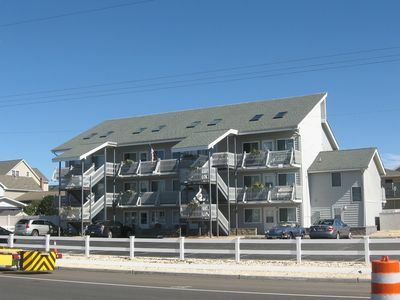 BEACH BLOCK, GREAT LOCATION. 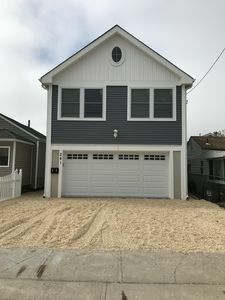 SHORT WALK OR DRIVE TO THE BEACH! 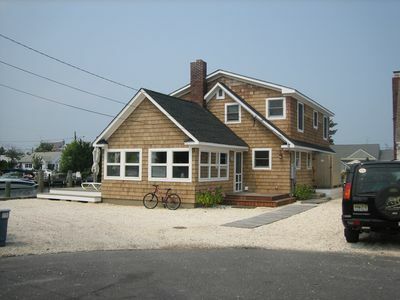 Beautiful cottage one block from beach! Booking for summer 2019 now!! 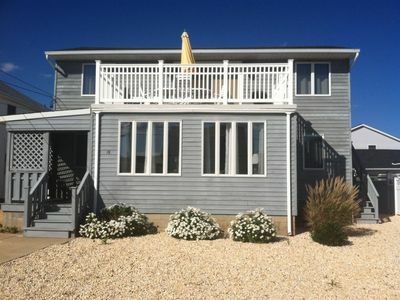 Steps to Beach AND In-Ground Private Pool! 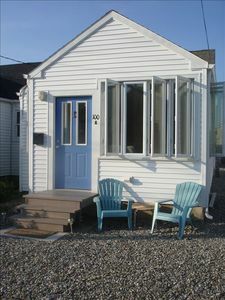 WINTER RENTAL! FULLY FURNISHED! 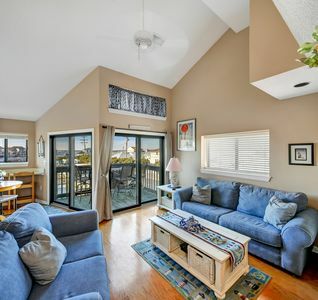 ADORABLE CONDO! 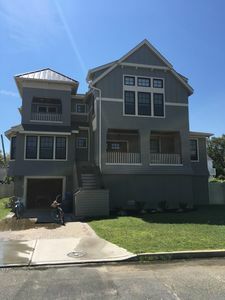 New house 5 BR/5BA walking to beach/board walk. 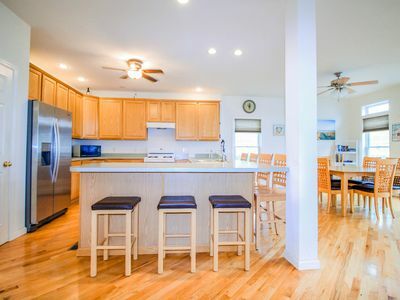 *NEW LISTING* MANTOLOKING, OCEAN BLOCK, PRIVATE BEACH AND MORE!! Beautiful! 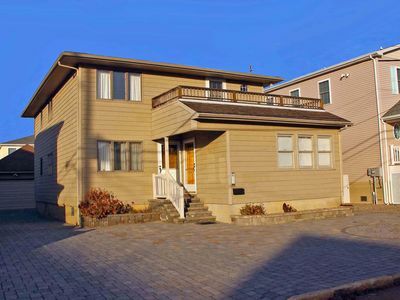 2 blocks to boardwalk, beach, restaurants and rides! Newly remodeled.